New York’s “young literary cubs” moving forward? I first saw this story tweeted via Iowahawk, and then via Instapundit. A bunch of recent college graduates with high-end literary degrees—resulting in $200,000 of debt in at least one case—have started their own literary magazine after being unable to get a job in the establishment literary market. The New York Times spins it as due to the current economic downturn. I’d guess that it has more to do with time marching on—the entire publishing industry has been trying very hard not to capitalize on the possibilities of mobile computers and networks. People seem to be focussing on making fun of the recent graduates. But I don’t get the problem here. This is what should happen when an industry’s dying: new upstarts start their own companies and build a better product. Think about what would have happened if the publishing industry got a bailout like the car industry: Rebecca Chapman would have gotten that unpaid job as an intern working on yesterday’s model. Instead, she’s building something of her own with a like-minded group of people who have a vision for the future of publishing. They’re not making money—but they wouldn’t be making money in the old industry either. That said, they could be doing the same thing without having spent $200,000 and several years—times however many people are involved in their venture—that they can’t get back. That’s up to four million dollars (twenty people, according to the article) and four to eight years per person. Even with inflation, a couple of million dollars would have been a great investment in their current venture, and four years is a long time on the Internet1. Just not being heavily in debt helps a lot when starting a new business. 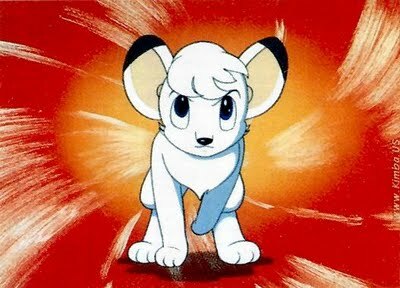 When I was a kid, I used to watch a cartoon called Kimba the White Lion. There is only one episode I vividly remember. There’s a big storm, and one of the biggest trees in the forest looks like it’s about to fall.2 It means the loss of homes for many creatures of the forest; it means the loss of a great tradition. So Kimba rallies the animals of the forest to save the tree—to literally prop it up by tying vines to it. They work hard to prop up the tree, risking their lives in a huge storm while giant branches fall around them. By the end of the night they’re exhausted, literally lying around on the ground as if they’ve just lost a great battle. And in the end they fail: there was no way to save the tree, it was too big and it was rotting from within. For all the good that it did in the past, the time had come for it to die. But after the tree falls, and after the storm passes and the exhausted animals wake up in the jungle sunshine, Kimba sees young shoots growing from the remains of the fallen tree. They were wrong to waste that much effort and risk that many lives trying to stop the cycle of life. All they accomplished was wasting their own efforts, and delaying the growth of new plants. It’s the same with publishing, with cars, and with every other business: when we expend massive resources to prop up dying business models, we are wasting money that could be saved for something that matters, and we are killing the new industries that would rise from the ruins. Better industries, that meet our needs—material or literary—more effectively. I have no idea what transportation we’re missing by having spent billions to prop up General Motors, and hundreds of millions on just one vehicle. But it’s probably a lot cooler than yet another failed electric vehicle like the Chevy Volt, and it would probably result in far more jobs going forward. What kind of amazing new media are we losing out on—along with all the new jobs they would bring—because we’re propping up the old, dying media industry with ill-conceived legislation like SOPA and the DMCA? We don’t know. We’re in the middle of a monsoon, we’re spending resources we don’t have, to prop up a tree that needs to die. Four years ago we were at the end of 2007. There was no iPad—there wasn’t even a MacBook Air. The recession hadn’t yet partially dried up investment money. There was a B. Dalton and a Borders bookstore chain, and there wasn’t an iBookstore. We didn’t know what the other side of Mercury looked like. Facebook wasn’t a platform for political campaigns. Googling for Kimba the White Lion, storm, and tree, and it appears the episode I’m remembering is The Sun Tree, episode 49. Contains all 52 episodes, from 1965/66. Governor Palin in India says something I’ve been pushing for a long time, especially with regards to our moribund auto industry: when we reward failing companies, we are killing all of the innovative startups that would have arisen in the vacuum of their failure. Where do they think city worker salaries come from? I had my own personal broken window this week. Not a big fan of obstructing progress for make-work jobs. Growing from the ruins of a rotting industry last modified December 23rd, 2011.